My sister picked it out. At the time, my sister and I owned the duplex I live in now. 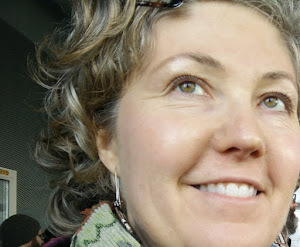 Sadly, she passed away 4 years ago last Saturday. The tree we planted survived though and thrived. 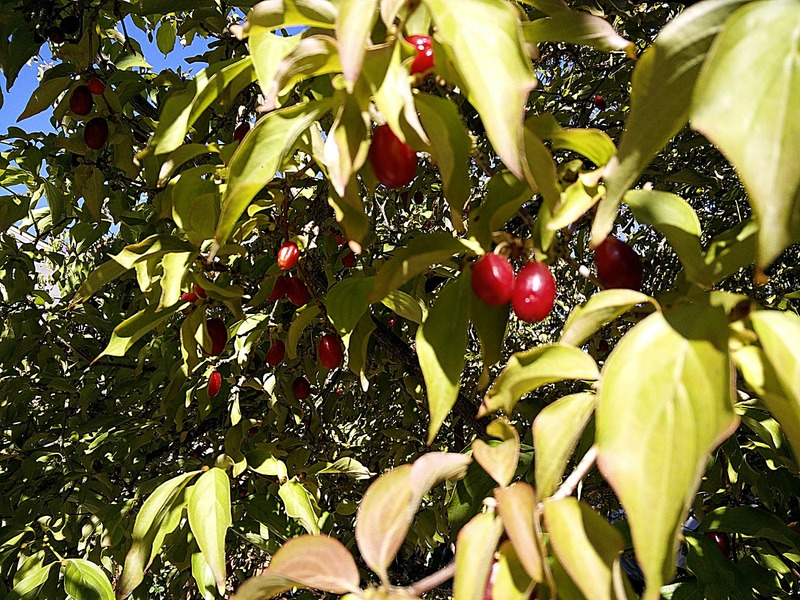 It's a Cornelian Cherry and if you have never heard of it before you're not alone. It's of the dogwood family and in the spring it blooms with beautiful yellow flowers. In the summer though, it's loaded with small, bright red, cherries that resemble a coffee berry. According to Wikipedia, the tree is native to southern Europe (from France to Ukraine) and south western Asia including Armenia, Azerbaijan, Georgia, Iran, Turkey, Israel, Lebanon and Syria. 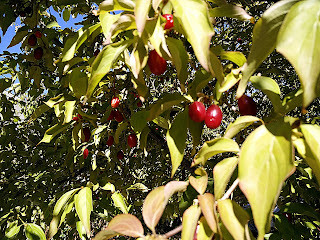 The cherry's taste is very tart, almost sour, and they are ripe once they turn bright red and drop to the ground. The seed of the cherry accounts for over half it's size. Last year, during my Home and Patio Sale, the tree was bursting with cherries when a lady approached to ask if she could pick the fruit. At the time, I was surprised anyone ate the fruit but she told me how it made wonderful jams. As she picked her fill of cherries, I decided next year I'd try my hand at cherry jam. 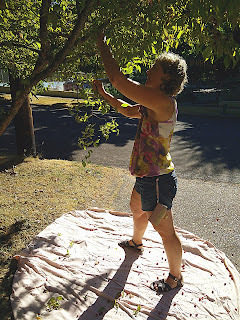 Fast forward a year and armed with a bed sheet and a colander, I went out to the cherry tree early last Saturday morning and started shaking the branches so the berries would fall on the sheet. It took less than 30 minutes to fill the colander (about 12 cups of berries). I washed the cherries and set them aside as I was waiting the arrival of my food mill from Amazon; I had no intention of pitting all those cherries one at a time. I was also waiting on a new canner and rack as I wanted to seal the jars of jam in a hot water bath. Thankfully my food mill arrived later that day, however, by Sunday afternoon my canner had not. Since the day was predicted to be 100 degrees and I had to go to work the next day, I decided to get started on the jam and make due with tongs and a deep pot I had. I brought the cherries to boil in about 5 cups of water for approximately 4 minutes. I then scooped out the cherries a cup or two at a time, placed them in my food mill, and started to remove the pits. I'm not going to lie, removing the pits from the cherries even with the food mill, was hard work and probably accounts for why you don't see a lot of cherry jam around. It wasn't long work, just hard work, and in about 20 minutes I had pitted all my cherries, yielding about 6 cups of cherry sauce. To this sauce, I added 2 teaspoons lemon juice and 3 cups sugar. I've read recipes that actually call for 8 cups of sugar! I couldn't bring myself to add that much, besides I didn't have it. I boiled the jam for about 10 minutes. Meanwhile, I had my jars and lids in the hot water bath sterilizing. Using a soup ladle I filled the hot jars with the hot cherry jam, put the lids on, and set them back in the hot water bath to seal for approximately 3-5 minutes. Although most cherries don't contain a lot of pectin, these particular cherries do and the jam set up nicely. The finished jam is a beautiful red color and has a nice lightly tart flavor. I think the cherry flavor is great on it's own however next year I think I may add a few habanero peppers to it for a little kick. Now if the weather would just cool down, I could make some homemade bread to eat with it!